This is the first blog of 2010! I went to Vegas for the new year and had fun with friends. Before that I had xmas down in San Diego and got cool camera gear from santa! Also my good friend Dylan Mayer and his wonderful wife Kelli took me to see Sherlock Holmes which was awesome!!! 2009 was pretty decent. Got moving on this whole photography thing, finished my first year of grad school, and spent some good times with some good people. 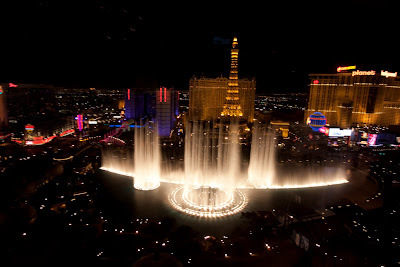 I'll throw in a pic of vegas just to make this blog post a little more interesting. Cheers kids and happy new year! water show--2.5 second exposures are hard with no tripod...but I am just that good! i have this same exact picture - but taken from the other side! [through the window of a room in planet hollywood] haha i should upload it.